We all know there is no such thing as the rumored Fountain of Youth, and we can’t just sit back waiting for doctors and research scientists to find new drugs and therapies to stop the hands of time. After reading Personal Trainer Eraldo Maglara’s book The Real Fountain of Youth: Simple Lifestyle Changes for Productive Longevity, you will realize that aging doesn’t have to feel dreadful and it is possible to keep living life feeling lively and productive without any medications or therapies. The Real Fountain of Youth is a how-to book for transforming your life, to be healthier and more fit with an end goal of productive longevity. Eraldo gives you step-by-step instructions on how to create a healthier lifestyle so you can maintain your activity level and independence as you age. He interviews health professionals in the nutrition and chiropractic fields to bring you a complete well-rounded program which will give you optimal results. A few chapters in the book include, “The Big Three: Cardio, Stretching and Weight Training ” that explores the specific benefits of three categories of exercise; “Nutrition is Essential” featuring an interview with Dr. Lori Magoulas, a registered dietitian from Monmouth County, NJ; “Eraldo’s 8 Quick Changes To Improve Your Diet and Health ” suggestions such as eliminating all deep fried foods from your diet and increasing your intake of fruits and vegetables; and “Quick Exercises When You’re Strapped for Time” exercises to strengthen your muscles when you’re on the go. Extended youth – longevity – is available to everyone; however, it doesn’t come easily. In order to feel your best throughout your whole life, you must work for it and keep motivated. 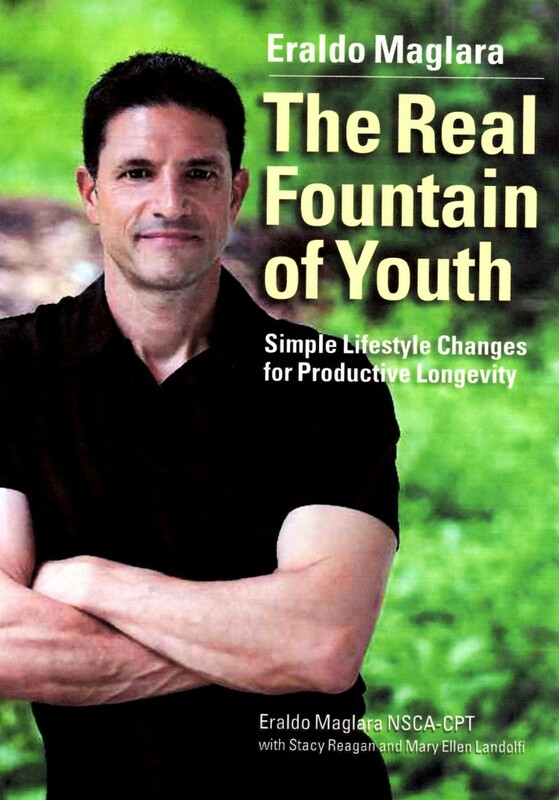 Eraldo wrote The Real Fountain of Youth to educate to people of all ages about how to achieve productive longevity through exercise and nutrition. Productivity doesn’t just end after retirement, and rather than seeing the aging process as something dreadful, we should all enjoy the later years of our life. After all, it’s a time when we can truly enjoy each and every moment to the fullest without worrying about an abundance of responsibilities.